The Courtauld Gallery, though limited by the restraints of its location in Somerset House, has managed to mount a wonderful exhibition in just two rooms, displaying a major turning point in Picasso’s career. He went to Paris for the first time in 1900, and in 1901 he returned aiming to win an exhibition. The precocious 19-year-old Spaniard was at the time relatively unknown outside Barcelona, but he had a broader reputation for his prodigious output of paintings. He was introduced to Ambroise Vollard, a dealer who had sponsored Paul Cezanne, and Vollard immediately agreed to a show at his gallery. Picasso returned to Paris in May with around twenty paintings and little over a month to produce enough work to fill the exhibition. 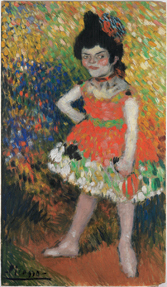 The some 64 works [and possibly up to 75] displayed at Picasso’s first Paris exhibition had been completed by working at a feverish rate, often all night, to finish them in the weeks leading up to their showing. He sometimes completed 3 canvases in a day. 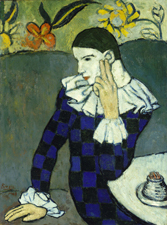 On June 24, 1901, the first major exhibition of Pablo Picasso’s artwork opened on the Rue Lafitte, Paris, known for its avant garde art galleries. 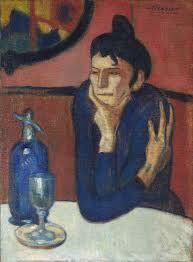 The Vollard show was a success, despite receiving only a few reviews, and launched Picasso’s career in Paris . Several of the paintings from this original exhibition were displayed in the first Courtauld room, and they show a swathe of influence from Manet, Toulouse-Lautrec, Gauguin and Van Gogh. None slavishly copied but the influences and even warm humourous homage are very evident. Street scenes, prostitutes and Can-Can dancers all form familiar reference points to turn of the century Paris and clearly show a precocious talent. But despite this, events, and his own desire to be an innovator and not just a talented follower took his art in new directions. The suicide in February that year of his close friend, Carlos Casagemas, who had accompanied Picasso to Paris led to him producing a new genre all his own. These are grouped separately in the second room and show his ability to take astonishing new paths As a prelude to his now famous ‘Blue Period’, the strong, bold, clearly outlined figures appear solitary, even when together, set in plain, pared back, surroundings. 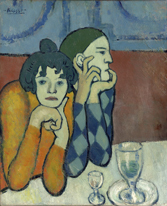 The series of drinkers at cafe tables, such as Harlequin with Companion, are extraordinary, and The Absinthe Drinker echoes a life ruined in its shadows and lines of bold green. 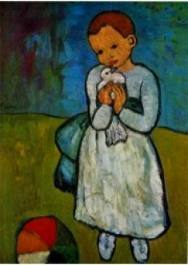 Some, such as Girl with Dove and Mother and Child, show a less clear style and were not, for me at least, particularly attractive or interesting. All in all a well staged exhibition drawing together many of Picasso’s key works of this life changing period. The ability within this one gallery to contrast these pictures with the outstanding collection of Impressionists displayed in other rooms showed that “Becoming Picasso” was an uneven progression from Post-Impressionist style with Spanish overtones, to one of melancholic contemplation in blue. As an exhibition I consider it an unqualified success!